Known as an eloquent and creative thinker, Jamake Highwater developed an artistic perspective as fluid and dynamic as the evolution of his own name. Highwater wrote about seemingly disparate fields and themes, showing their inter-connectivity. Both an insider and an outsider, Highwater enjoyed what he considered to be a distinctive Native American sensibility that expected individuals to be transformed rather than retain a fixed identity. Highwater was known as Jack Marks as a child of adoptive parents in the San Fernando Valley. Jack Marks changed his name to J Marks after he graduated from college and co-founded the San Francisco Contemporary Dancers, where he served as the company's director and choreographer for twelve years. In the early 1970s, Highwater began seriously considering issues pertaining to Native Americans. Highwater received a statement from his biological mother in 1974 that indicated his Native American lineage and his given name of Jamake Highwater. When he began writing professionally, he assumed the name J Marks-Highwater and Jamake Mamake Highwater before he settled into Jamake Highwater. 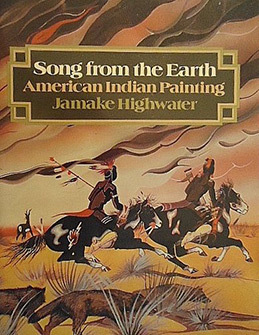 During the 1970s and 1980s, Highwater authored multiple books and articles on the mythologies, art, and dance of Native Americans. His Song from the Earth: North American Indian Painting (1976) was an innovative survey of twentieth century Native American paintings. Throughout his career, Highwater wrote over thirty books for adults and children on subjects such as architecture, theater, literature, mythology, dance, sexuality, and Native American issues. Highwater, who traced connections between diverse subjects, has been lauded as “an eloquent bard whose words are fire and glory” by Studs Terkel. In addition to his art activism, Highwater was a professor at New York University and Columbia University and a guest lecturer at dozens of universities. Having spent most of his adult life living in New York, Highwater returned to Los Angeles in 1998 and lectured at UCLA. He died in June 2001.